1-800 RID-OF- IT offers professional and reliable junk removal and disposal services in the Greater Toronto Area (GTA). 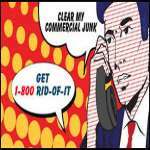 1-800 RID-OF- IT specializes in commercial and residential junk removal services along with event cleanup services. We offer same day junk pickup and make sure no damage is caused to your property during this process. We have a team of professionals trained to provide you with the best services available. With our online price estimator you can find the best rates for junk removal and bin disposal in Toronto. Our company deals in residential junk removal, commercial junk removal, large and small event clean up as well as waste removal, trash removal, appliance recycling, carpet removal, scrap metal removal, TV disposal, dirt removal, yard waste removal and a lot more. We provide services in the Greater Toronto Area (GTA) including Burlington, Concord, Don Mills, East York, Etobicoke, Oakville, Mississauga,Richmond Hill, Scarborough and Toronto. We are a BBB accredited business and have received HomeStars Best of Toronto Awards for Junk Removal (2013 - 2016).